This sequel to A Dash of Trouble finds Leo initiated into the magic of her family and working at their bakery in Rose Hill. Her sisters still think she is too young and irresponsible, and also think that her friend Caroline distracts her. It's also a bit tricky that Caroline knows about the family's magic, and some of the sisters are very opposed to sharing this information with outsiders. Caroline has been visiting her deceased mother's family, and really needs to talk to her friend, but the bakery is very busy, and Leo brushes her friend off because she really wants to learn more magic. Her Tia Paloma is teaching the girls about candles, and how they can be used to communicate with others, even the dead. The next morning, Leo's Abuela, who died a while ago, shows up in Leo's bedroom. She's not a zombie, she's not a ghost; some spell has made her come back to life. Not only that, but several other Rose Hill residents have been dragged back from El Otro Lado, including a former mayor, the music teacher at the elementary school, and a classmate's grandmother! Leo is blamed for this, and because the bakery is so busy, Leo's mother sends her off with her sisters and aunt to try to reverse the spell. This is difficult, because Leo doesn't think she had anything to do with the spell, and the people who have come back each have their own agenda and keep going off to accomplish it! Abuela is very helpful, but she is getting younger and younger, and Leo eventually realizes that if she is not sent back to El Otro Lado, she will cease to exist on any plane. There are some surprises when it comes to who summoned the spirits, and what other spirit has been summoned, but in the end, things are put right and Leo gains a tiny bit more respect from her family. Strengths: Leo's struggles with maintaining her friendship with Caroline, learning more magic, and finding a balance in her life were very interesting. It's nice to see that her family was intact and supportive, and the details of running a bakery were fun. Her Abuela was great-- sure, it was nice to enjoy a cup of coffee and see her family, but she was dead and felt that she shouldn't be hanging out with the living. Healthy attitude. The twists with who cast the spell and who else was summoned were great, and I don't want to spoil them! Weaknesses: I still don't care for Leo very much, although she is improving. Also, I wasn't as interested in the exploits of the spirits; I wanted to know about Leo and Caroline's relationship and the magic instead, so chasing around after the mayor and the piano teacher slowed down the story for me personally. What I really think: Definitely purchasing. 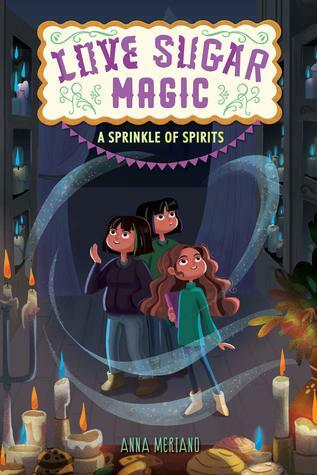 This is a nice blend of family and friend drama, magical realism, baking and adventure that is as tempting as a freshly baked cinnamon roll to my students. 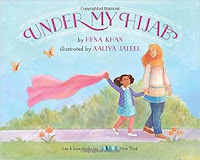 In this picture book, young girl describes how six women who are close to her wear their hijab in public and also how they dress when they are at home. From her grandmother, a baker, to her aunt and cousin, to a scout troop leader, the girl tells about a variety of ways a hijab can be worn. There is even a cousin who has a sports hijab. Written in rhyme, the book ends with the girl thinking about how she will style her own hijab if she decides to wear one. There are notes at the end of the book detailing why some Muslim women wear the hijab, but also explaining that some women, like the author, do not. Strengths: This is a fantastic, short book for elementary school students. It can either be a mirror or a window, and may help students understand why their classmates wear the hijab. (In my district, I have seen very young elementary girls wearing the hijab.) I didn't see the color on the illustrations, but they seem very cheerful and full of detail in the black and white E ARC. There seemed to be a bit of variety in the complexions and hair styles of the women and girls. I especially appreciated the inclusion of a girl playing sports; now, if we could just get a description from the Ohio High School Athletic Association on what constitutes an acceptable cross country uniform for observant girls! Weaknesses: I would have like to see more of the end notes worked into the main text. The verse was fine, but limited the descriptions so that it's not quite a book for middle school. What I really think: I would like to see more middle grade books (The length of The Hijab Boutique) with Muslim main characters who are from different cultures. My school has a large Somali population, but it seems like many of the Muslims in middle grade literature are disproportionally from Pakistan. My Somali girls usually wear long dresses and are more covered up than the girls whose cultural background is from other countries.